Welcome back to another rendition of Six Degrees of Kool Books! This is an original theme created by myself and DJ Edwardson. If you want to play along you can learn more about how this game works HERE. Last week, DJ posted about characters from Treasure Island, but none of those characters sparked a connection for me. Fortunately for me, JL Mbewe also played Six Degrees last week, and she posted about the characters in The Chronicles of Narnia. This led me to thinking. She had already used Edmund, my favorite character from the series, and the one I tend to see connections to in other stories the most easily – but nobody ever said this game should be easy, just fun! All this thinking led me to Lucy. She’s a tough one to compare to other characters because she’s just so… Lucy. Lucy is innocent, trusting, she’s the epitome of child-like faith, and the person I always wish I was whenever I read these stories. It’s hard to find other characters as good and loyal as Lucy, but I think I found one in Willow, who features in Terry Brooks’ Magic Kingdom for Sale: SOLD! and the following series. The Magic Kingdom of Landover is in need of a king. And Ben Holiday is in need of an escape. His beloved wife died prematurely, leaving him heartbroken and with very little joy remaining in his life. When he stumbles across a ridiculous-sounding article advertising a “Magic Kingdom for Sale” – it is exactly the sort of thing he needs, and exactly the sort of thing his wife would have wanted to investigate further. Ben buys the kingdom, becomes its king, and discovers that a few key details were left out of the ad. The kingdom is practically in ruins. The various races that inhabit Landover are on the brink of war. And a dragon is marauding about the countryside. Most other men would quit and go home. But Ben Holiday is a little bit like Jack Reacher. He’s just a guy “with nothin’ better to do.” He decides to tackle the seemingly impossible task of putting Landover together again and truly becoming its king. The only help he has comes from a few of the remaining people still loyal to the throne of Landover. Questor Thews, a bumbling and somewhat incompetent Wizard… whose spells generally don’t end up the way they are intended, and often cause more problems than the one he is attempting to fix. Abernathy, the extremely dignified court scribe, who was accidentally turned into a dog by Questor Thews… and Questor now cannot figure out how to turn him back into a man… though he was able to restore his hands, speech, and ability to walk upright. Abernathy is incredibly embarrassed about his appearance, but he does not let it interfere with the performance of his duties. Along the way, Ben meets Willow – who is lovely, somewhat childlike though she is a full-grown woman, and has a habit of turning into a tree on certain nights. Throughout the story, Willow is the only one who never doubts Ben’s ability to become the king. Like Lucy, she is unwaveringly faithful to the end. A few other characters from this story are Kallendbor, one of the haughty Lords of the Greensward who refuses to acknowledge Ben’s claim to the throne when Ben refuses to seal an alliance to their people through marriage to one of the daughters of the various Lords of the Greensward. There is also the River Master, Willow’s father, and a fairy being of enormous power, though his magic has diminished in the past several years along with everything else magical and beautiful in Landover. He respects Ben’s “get it done” attitude, but also refuses to swear fealty because he feels there is nothing in it for him. He is also very bitter towards the other races that inhabit Landover and unwilling to be the first to bend. Last, but definitely not least, there are the more villainous creatures Nightshade and Strabo. Nightshade is a witch of great power and great cunning, and little love for anyone but herself. Strabo is the marauding dragon I spoke of earlier and the last of his kind. He is powerful, proud, and very, very lonely. For being a cunning, malicious, evil-seeming sort of dragon, he is also quite sad, and later in the series he does end up helping Ben more than he ends up hindering him… much to Strabo’s never-ending chagrin… but he has a soft spot for Willow, who sings for him and seems to understand and empathize with his loneliness. So, there’s a list of characters for you all to choose from for next week. Hopefully I provided enough variety. This is one of those stories with many characters. It’s well-written, fun, entertaining, and quite hilarious. It’s one of those few stories that makes me laugh out loud while I’m reading it. If you’d like to join in the fun, make sure to sign up below! What an intriguing premise for a book! The characters sound great too. I love this series, it’s just so much fun. 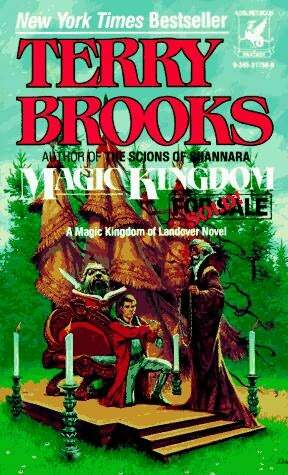 I also love that Terry Brooks keeps his fantasy clean. It sounds like a wonderful, fun book!!! I am going to have to read it this summer. I think I read the first two books of this series, but my memory is a bit foggy. Questor Thews certainly rings a bell and of course the basic plot. I’m drawing a blank on Willow, though. I no longer have my copies but this post makes me want to pick them back up again at some point. You’re right, lots of great, colorful characters to choose from!